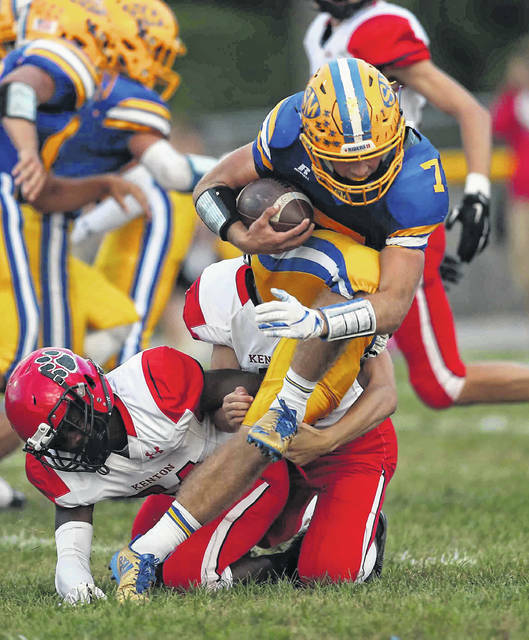 St. Marys’ Sean Perry fights for yardage against Kenton’s Malik Jett, left, and Jacob Eversole during a Western Buckeye League game in September at Skip Baughman Stadium in St. Marys. Perry is part of a Roughrider senior class that head coach Doug Frye describes as more leading by example and not so much “rah rah” guys. ST. MARYS — Most families want to be together on Thanksgiving. Members of the St. Marys football family want to be practicing. Because if the Roughriders are out practicing that means they have cleared this weekend’s hurdle of beating Clear Fork in the Division IV regional final at Bellefontaine’s AcuSport Stadium at 7 p.m. Saturday. Sean Perry, the WBL defensive back of the year and first-team, All-Northwest district selection and defensive back of the year, added that the season has been fun. The senior added that he to hopes to be on the gridiron on Thanksgiving for a chance at a state title. “We wanted that three-peat in the WBL and we got it,” Perry said. “We definitely protected our borders and are looking to practice on Thanksgiving and play in a state championship game. When asked why St. Marys has been so successful, both Perry, who also plays running back, and senior center Mitch Seewer have the same answer. While that is an oversimplification of the team’s success this year and in the previous three years where the Roughriders made the playoffs, it is an example of how uncomplicated the approach to winning at St. Marys is with 17 seniors leading the no-nonsense Roughriders in games. St. Marys enters the Division IV regional final against Clear Fork after beating Van Wert, 55-20, and prior to that the Roughriders downed Pepper Pike Orange 48-13 in the postseason opener. In both wins, St. Marys has used the same formula that has carried it to a 10-1 record and pretty much the entire time St. Marys head coach Doug Frye took over and that is run the ball and play solid defense. The well-oiled Roughrider offensive machine averaged 45 points a game and 306 yards on the ground. Defensively, St. Marys gave up 246.8 yards a game and that ranked second in the WBL. The lone blemish on the Roughriders’ season was a last-second loss to Wapakoneta in the final game of the regular season. While disappointing, St. Marys still garnered its third consecutive WBL title. This is a far cry from when the duo were freshmen and the Roughriders missed the playoffs. But since that time the Roughriders have made the regional finals two years ago and last year lost in the second round to Shelby, something that still lingers in the mind of Seewar and Co.
“We’ve learned that losing around here doesn’t feel too good and we want to keep winning,” Seewar said. Because the team does not like to lose, the work to win like most successful teams begins in the weight room during the offseason and conditioning is one of the keys to the Roughriders’ winning run Seewar said. Like Seewar, Perry did not get a taste of varsity action until his sophomore season and he said it helped that the team made the playoffs in their early years so they could get a feel for what to expect and being under a microscope so to speak. “It’s beneficial to every one on the team practice-wise because the longer you stay in it the more practice, and it is more valuable than being in the weight room,” Perry said. Preparation for the upcoming game remains the same. “Each week each team gets a little tougher and we just have to keep practicing hard and this is our last chance as seniors to put a stamp on the season,” Seewar said. Another motivating factor for these two who have brothers and fathers and grandfathers that have donned the blue and gold in the past is bringing St. Marys back to prominence and said it is tough to stay on top. Perry added that he has seen the attitude of the team and knows they want to continue winning until state. Frye said Perry started his sophomore year the final three postseason games but the vast majority have not been to this level of the playoffs. Frye added that the senior leadership has been a vital component of the Riders’ success and describes them as more leading by example and not so much “rah rah” guys. Frye is looking to continue the good times against Clear Fork but understands it is not going to be easy. Clear Fork averages 58.8 points a game and gives up 4.7 points a contest. In the Colts two postseason games, Clear Fork has outscored the opposition, 46-14. Clear Fork’s Trevor Trammel is the team’s top rusher, finishing with 1,007 yards and 15 touchdowns during the regular season, and in the Colts’ regional semifinal contest against Clearview, the senior tailback amassed 261 yards rushing and three touchdowns. In the postseason opener, Trammel accounted for 257 yards rushing and receiving and three scores. Frye said field position and the turnover battle will be the keys to the victory.